A good friend of mine once said "success may come from where you least expect it." I have been interested in Photography since I was about 14 when my Dad brought home a carrier bag (well, 3 actually) from a recent visit to a local camera shop. He was a keen Photographer and on the advice of the salesman, he had bought an Olympus OM-1 plus telephoto and wide angle lenses. The next 2 or 3 years saw me joining all sorts of clubs and subscribing to all things photographic. I saved up enough money to buy a camera like Dad’s (without the extra lenses) and I hardly went a day without being out and about taking photos. I had also decided I wanted to do all my own printing so I bought an enlarger together with enough darkroom equipment to allow me to develop my own films and make prints. I worked more or less exclusively in black & white. 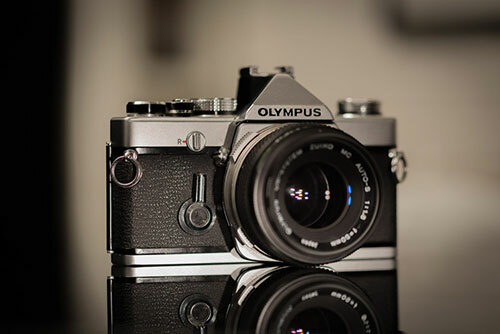 The classic Olympus OM1 - often referred to as "The Japanese Leica." It was 1985 now and I was still working for the same camera shop I joined from school, whilst continuing my photographic studies and I had nearly warn out the Olympus, it was getting so much use! EastEnders had been born in the February and in July, a chap called Bob and his mate Midge persuaded virtually everyone who was anyone in the music business to contribute to the now famous Live Aid concerts at Wembley and The JFK Stadium in Philadelphia. I got a call from from the local newspaper who told me that a major sports retailer, who were opening a shop in the city, had secured the services of none other than Daley Thompson to open it. Yes, the same Daley Thompson who had been dubbed ‘the greatest athlete of all time’ and the current decathlon world record holder. Problem was, all the newspaper staff photographers were on other assignments so would I be interested in covering it for them. Well, actually they asked me if I knew of a photographer that might be available… of course I didn’t!! “I would be happy do it for you” I said. They agreed. They actually agreed! I could hardly believe it! I packed my camera gear and headed off along the high street. I was shepherded through the crowds and inside the shop where a few official looking people were standing around talking. Mr Thompson was going to be sat at a table at the back of the shop, signing autographs and it was my job to photograph this for the paper. After dozens of people had passed through, I spotted a girl with her arm in plaster and as she approached the table, she offered her arm out for signing, I called out for their attention. “Daley” I said (like he was my best mate!!! ), and both he and the girl looked over and I snapped away. Bearing in mind this was the pre-digital era, I was not able to check the shot and I only got one chance at it so I was eager to find out if it had worked. I got it back to the dark room and, to my relief, it had turned out perfectly. I sent the negatives over to the newspaper offices and, to my delight, the shot made the front page! My career as a freelance press photographer had begun. I went on to cover lots of other local events for the paper ranging from school plays to sports events. Although I know longer do press photography, it has influenced my style to an extent and I have brought the relaxed, documentary feel to my main specialist areas - commercial, wedding and portrait photography.